Regular hand washing lowers the number of victims of diarrheal diseases more than 30% and particularly reduces incidence of such diseases in people who have weaker immune systems by almost 60%! Regular hand washing also cuts the incidence of respiratory disease like colds and flu by about 20%. So, although handwashing isn’t the only factor in avoiding these illnesses, keeping hands clean certainly helps a great deal! Loyal Hygiene pays particular attention to the restroom cleanliness by focusing heavily on the hand washing station. This is a prime hot spot for bacteria growth. It’s not enough to simply provide a bar of soap on a dish. Too many people use it, and not all of the microbes left behind are killed by simple proximity to the bubbles. The bar of soap also might (and often does) slip out of people’s hands, landing and sliding on the restroom floor or in the sink. And it probably doesn’t take much imagination to understand why that could be a microbial risk issue. Hygienic, refillable soap dispensers, in minimal- to no-touch models, measure the appropriate amount of soap for proper hand washing. They are an economical, safe way to ensure your facility restroom hand washing station is cleaner and provides fewer chances for opportunistic microbes to hitch a ride on your employees or patrons. Loyal Hygiene has a wide range of restroom hand soap dispensers that we install and service. From foam or liquid soaps to hypoallergenic or antibacterial soaps, we can provide what you need to keep everyone’s hands clean and soft. We also install and service the paper towel dispensers using Green Seal paper for environmental safety and responsibility. Everyone needs to spend time on the throne, and it’s a notorious microbial location in any restroom. Aside from having your janitorial staff regularly clean and check the toilets for cleanliness issues, you’ll also want to remind them to check the hinges to the seats so they don’t break or snap off when someone has a seat. Loyal Hygiene helps you help everyone who visits your restrooms avoid contact dangers by installing flushable paper toilet seat cover dispensers at the point of necessity. It’s a quick and easy way to add an extra barrier against lingering nasties. We can also install hand sanitizer dispensers nearby to help cut down on bacteria left between the loo and the handwashing station. Using environmentally-safe formulations, our odor control products come in far more pleasant scents including English Garden, Pure Linen, Tropic Wave, Citrus Blossom, Raspberry, Cinnamon and Grapefruit. Water, soap and other slipping dangers are another common restroom safety issue. Just throwing down a regular bathroom rug isn’t going to cut it in a restroom used by many people each day. That thing is going to get downright nasty in a couple of days. Fortunately, Loyal Hygiene has a floor mat service that regularly rotates dirty restroom and urinal station floor mats with freshly-laundered anti-microbial, absorbent, non-slip floor mats on a regular, reliable basis. This reduces slip and fall risks, microbial migration and odor as well. Let Loyal Hygiene help improve your restroom cleanliness and restroom safety, making your facilities a safe, clean, pleasant place to find a moment’s respite. 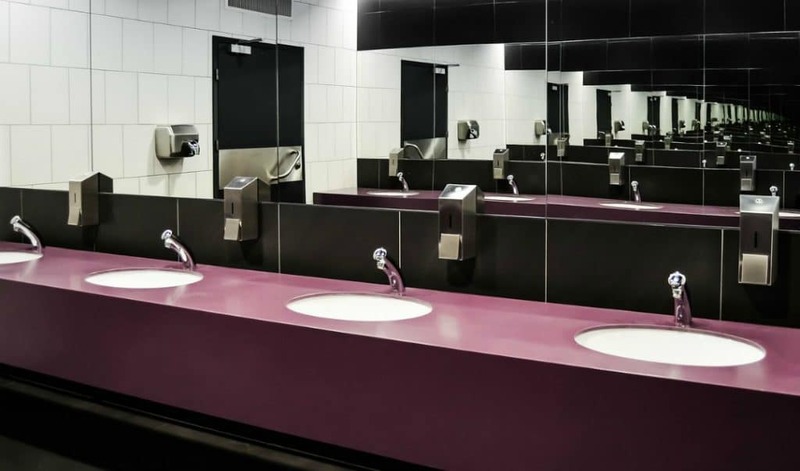 We’ve been Northern Virginia’s restroom service and supplies team since 1979 and pride ourselves on prompt service and the excellent cleanliness of the restrooms we care for.